Years before Pinterest, I organized my internet bookmarks by category (flowers, wedding cakes, dresses, etc). This image from Martha Stewart Weddings will always stick with me as one of my oldest favorites. 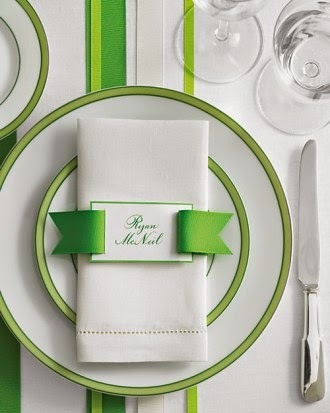 Not only is the kelly green my favorite color, but the clean, fresh look is perfect for a spring or summer wedding. From what I can tell, this could be a DIY with an X-acto knife in just a few hours. Try grosgrain ribbon for spring/summer weddings and satin or velvet for elegant or fall/winter affairs!